Violent extremist groups represent one of today's most pressing security threats. With the increasingly large amounts of territory that they occupy, the substantial resources they generate, and their sophisticated use of social media and communication tools to propagate their message and incite violence, urgent and coordinated approaches are needed to counter these groups. With this evolution of violent extremism in mind an increasing number of Member States have voiced concerns over the risk that environments. 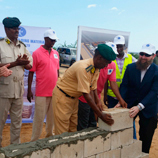 A ground breaking ceremony was held at the site of the Mogadishu Prison and Court Complex (MPCC) in the Somali capital. This is a significant step towards providing the Somali justice system with the infrastructure and resources to conduct trials in a safe and secure environment for both prisoners and judicial staff. attitudes. When completed, the MPCC will also allow for justice to be administered in Mogadishu to high-risk detainees. 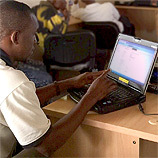 UNODC's Global eLearning Programme is a knowledge platform available to law enforcement officials across the world. The Programme's courses address current security threats such as transnational organized crime, illicit drugs, human trafficking, and migrant smuggling, as well as border and container control, forensics, and human rights, among other subjects. The Programme has been designed to reach public officials. 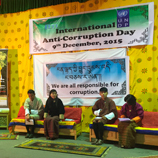 Marking International Anti-Corruption Day various events were organized by UNODC field offices, civil society organizations, Governments, and individuals to raise awareness about corruption. UNODC and UNDP informed people how the issue affects many areas and that it is imperative to tackle corruptions, in order to achieve the Sustainable Development Goals. With the slogan 'Break the Corruption Chain,' people were called to tackle this issue. 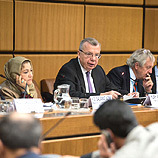 Representatives from Member States and senior officials from leading international law enforcement organizations met to launch a new UNODC Global Programme on Building Effective Networks Against Transnational Organized Crime - known as BENATOC. 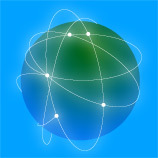 The global programme aims to improve intelligence-sharing and enhance capacities to collect and analyze data,promote a network of law enforcement training and educational institutions. Opium poppy cultivation in the Golden Triangle stabilized in 2015 at 55,000 hectares (ha) in Myanmar, and 5,700 ha in the Lao People's Democratic Republic (PDR), according to the lastest Southeast Asia Opium Survey 2015 released by UNODC.The survey shows that Myanmar remains Southeast Asia's top opium producer in the Golden Triangle. A new Afghan National Action Plan to counter the threat of illicit drugs was presented recently at a high-level meeting in Vienna. The new strategy balances confronting drug trafficking with plans for reducing drug demand and encouraging sustainable development in Afghanistan and neighbouring countries. 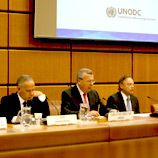 At the meeting, UNODC Executive Director, Yury Fedotov, described the plan as a "blueprint for all partners". A joint cooperation framework between UNODC, Japan and Russia aimed at supporting Afghanistan and Central Asian countries to tackle drug trafficking recently entered its second phase. To mark this milestone, the first in a series of specialized trainings given to the Afghan Counter Narcotics Police was held at the All-Russia Advanced Training Institute of the Ministry of the Interior, commonly known as the Domodedovo Training Centre. More than 30 researchers from around the world who work in the field of drug demand reduction, together with over 200 participants from 85 countries, gathered in Vienna to discuss the latest findings in drug prevention and drug dependence treatments. They also discussed programmes that have proven to be effective in stopping or reducing the negative health and social consequences of drug use and explored in detail diverse related topics.